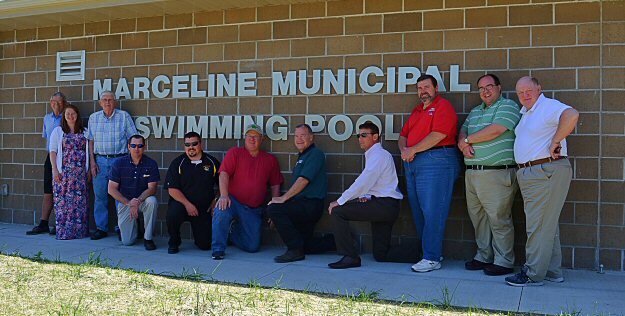 Marceline, MO - The Marceline Rotary Club and the City is proud to present the new Marceline Municipal Swimming Pool wall lettering made possible through a grant awarded to the Rotary. In July 2017, Marceline Rotary Club submitted a grant application for a 50%-match grant to purchase and apply lettering to the new pool bathhouse. A $1,000 grant was awarded in October, and the Rotarians matched that $1,000 with money made from their annual funnel cake sales during the Marceline July 4th Celebration. The 10” brushed aluminum cast metal letters were ordered and custom made to be proudly displayed on Marceline’s new pool house. 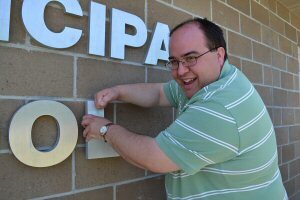 The Marceline Street Department measured and prepped the mounting surface and members of the Rotary were on hand to assist with the final installation. Rotary grant money is dependent on contributions to the Rotary Foundation, and fortunately money has consistently been available through the Rotary District Grant Program. In 2016, the Marceline Rotary Club was also awarded a matching grant, which went towards the purchase of some of the new trees in Ripley Park. Rotarians pictured from left to right below are: Jim Payden, Lindsay Krumpelman, Bob Cupp, Jacob Gordon, Adam Stallo, Jeri Holt, Gary Spencer, Pat Kussman, Aaron Ervie, Brian Baker, Gary Carlson.